Before we proceed to do project on 7-segment display it is necessary to understand its working. So, it is necessary to read this tutorial to go further. First we should know how 7-segment display works, if you red my previous post i.e LED Dice then it will be easy for you to understand this project too. Showing numbers on to the 7-segment display is exactly similar to that of showing pattern on the LED dice which we have seen before. 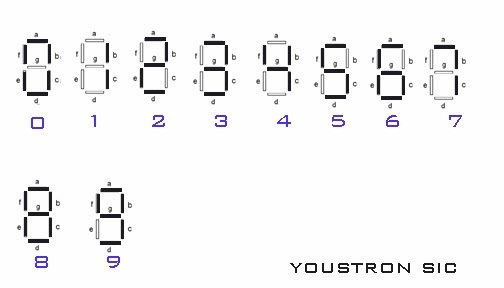 7-Segment displays available in two different configurations. In Common Cathode configuration all the -ve terminals of the leds are connected to ground, to turn ON specific LED corresponding led pin should be high. Look below fig. In Common anode configuration all the -ve terminals are connected to voltage source, to turn ON specific LED corresponding led pin should be Low. Look below fig. We use Common cathode 7-segment display in project, so let us look its working to display numbers. Assume 7 Leds(a,b,c,d,e,f,g) are arranged as shown in the below fig. To show pattern '0' then if we ON leds a,b,c,d,e,f then it looks like '0'. For showing 1 if we ON leds b and c then it will look like '1'. Similarly if we want to show 5 then LEDs a,f,g,c,d should be ON. Look at the below fig to understand which leds should be ON for showing different digits. We connect each pin of 7segment display to microcontroller port pins. Depending upon the value we want to display, corresponding hexadecimal values will be sent to that port. We have just converted the binary values to hex values, look at the below table to understand better. 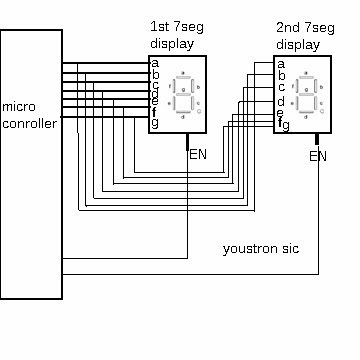 Multiplexing two 7-Segment Displays: If we want to connect more than one 7-segment display to our microcontroller then the number of micrcocontroller pins required will be more. Your thinking is right, if we send any value then both the displays shows the same value but only when both the EN pins are high i.e active. Lets take an example to understand clearly. For example we want to display 58 on to it i.e '5' on the 1st display and '8' on the other. First we will make '2nd segment display' Enable(EN) pin OFF and '1st segment display' EN pin ON, there by we send '5' (corresponding value) to the port pins. Now 5 only appear on 1st display but not on 2nd display because 2nd display is in OFF state. Similarly we OFF the 1st display and ON the 2nd display and send the value 8. Now it appear only on 2nd display because 1st display is OFF. If you understood this concept then you have understood concepts of 'LED CUBE' , ' SCROLLING LED DISPLAY' ,etc. I hope i have explained you as simple as possible. My next project will be on the project using 7segment display. You must be aware of the LED display with micro controller which has been designed to produce such an amazing product. I know a website leddisplay.org which has been building the LEDs with Micro controller.